Welcome to the JVNP 2.0 Update featuring a primary JV invite courtesy of fellow JVNP 2.0 Partners Andrew Hansen + Sara Young (Digital Worth Academy course, software suite & coaching program high ticket launch ClickBank affiliate program JV invite), Buzz Builders, and More … in Today’s get your digital assets in gear edition.. If you like high commission offers that can net you 4 figure checks, even if you only refer a few sales, there’s a launch coming up that will probably be your best promotion of 2018. Long time JVNP Partners, Sara Young and Andrew Hansen, are releasing a new offer on August 21st, with $900+ per sale commissions up for grabs. It’s called Digital Worth and it’s for you if your lists are into affiliate marketing, SEO, niche sites & blogging… or just looking for an online business they can start that actually works for regular people. Their JVNP Featured launch in 2016 saw multiple 6 figures paid out to affiliates as well as $50k in bonus cash during the launch contest. Short on Time? Jump right on over to the JV Page for complete product launch details including affiliate registration. Need More Reasons To Promote? No need to send your list to another hype machine and leave them teetering over the unsubscribe button. This launch will be webinar based, and the content given out from pre-launch to close will be informative, actionable and inspiring. Mail to a free webinar, or a free report, both packed with value, and let them do the rest of the selling for you. 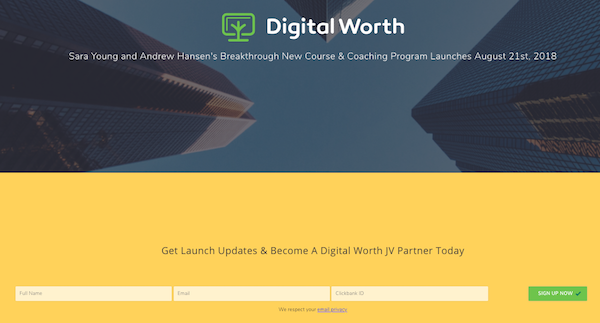 The Digital Worth program is set to be outstanding, with comprehensive training, an ongoing coaching program, & full software suite as part of the offer. 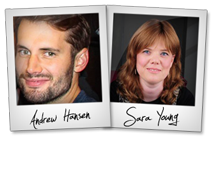 In Andrew & Sara’s last program, more than 50% of students actually made money with the training. You know what happens when you recommend your subscribers something they actually make money with? Hint: It doesn’t cause them to buy less of your recommendations in the future. Register To Become A JV Here. After that, keep your eyes peeled for the affiliate approval email and subsequent JV notifications, containing access to your promotional tools, and clear instructions on how to generate maximum revenue from minimal traffic on August 21st. I hope you get a chance to be part of it. Imran S, John Di Lemme, and other fellow JVNotifyPro 2.0 partners are waiting in the wings … keep your eyes on your Inbox, and follow the action in the JVNP 2.0 Premium VIP JV Announcement archives.